Here are ten useful tips of advice from a bicycle accident lawyer to follow if you have been in an accident. 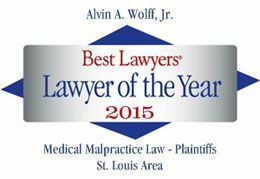 You can also learn more about how to handle a bicycle accident in St. Louis, or any city, by calling the Law Offices of Alvin Wolff Jr. at any of the numbers which can be found on our website at http://www.alvinwolff.com and learning how we can assist you. Obviously, if you have had an accident, and you are reading all of this advice, it's probably been at least a few days since the accident. However, if it's only been a few hours or if you ever have another accident, here's what you should do the next time from the start. First, take a look around and determine if you or anyone, are hurt. If so, taking steps like trying to prevent further injury or loss of blood are the most important thing you can do. Even if some other driver caused you to be injured, it's just good manners to help the other driver if they are hurt. They may even be so thankful that they admit their fault to you. The worst thing you can do is get angry or start a fight. Second, make sure everyone is safe from being injured further. If you are in the middle of traffic, and you are dizzy, sit down away from traffic. If your bike is a traffic hazard, get the bike out of the road. Let the police an other emergency personnel investigate the scene with other vehicles in place and move them more safely at a later point. Third, call the police. Accident reports are extremely helpful if the police will do such a report. Let the police know you are injured immediately. Answer the police questions honestly. But if you are dazed or confused, let them know you need medical treatment and answer only what you feel sure about. Remember, your statements can and will be used against you if you admit fault, and it will be too late and too fishy to later say you didn't know what you were saying at the scene. Police, insurance companies and juries know that your best recollection is immediately after an accident. Fourth, get the other driver's information including their names, addresses, driver's license numbers, make and model of their vehicles, license plate numbers, and their insurance company name and policy number. If there are witnesses, get their names, addresses and telephone numbers as well. If the other driver makes any admissions of fault, write those down as well. Fifth, if you have a camera on your cell phone and you aren't too injured, take some photos of the vehicles and the scene. If you can't do it right away, do it after you are released from the hospital. Sixth, if you are hurt, obtain medical treatment. Don't decline the ambulance or hospital examination to save your insurance company money or to be stoic. Take your valuables off of your bike if you can and get checked out at the hospital. If you are not hurt, don't get treatment you don't need. However, remember, after an accident, you may feel a rush of adrenaline that causes you to only start feeling symptoms of pain a few hours later. If you have a health plan that requires you to obtain permission first, call them and find out where you are allowed to seek treatment. Seventh, call a good bicycle accident lawyer as soon as you have had your initial treatment, so the attorney can gather other important evidence and prevent the insurance company from taking advantage of you and obtaining such things as recorded statements that you feel fine, when many of your symptoms have yet to manifest themselves. A good bicycle accident lawyer can save you from making a great deal of mistakes and can shoulder much of the hassle of knowing what to do about car repairs, car rentals, medical treatment, witness statements and the like. If you think you will save money by not having an attorney, think again. A good motorcycle accident lawyer can almost always obtain much higher settlements, obtain reductions of medical bills and insurance liens and prevent you from making costly mistakes. Also, most bicycle accident attorneys advance costs of obtaining police reports, medical records and the like and are paid and reimbursed for these costs only out of any settlement. Eight, you will need to report the accident to your insurance company, but since they will want to take a recorded statement from you, just like any other driver's insurance company, it's good advice to retain an attorney first. And if the other driver did not have insurance, remember that it is your own insurance company that will be your adversary. You will also need to report the accident to the Department of Motor Vehicles and your lawyer can give you the form for this. Tenth, don't pay a traffic ticket without a fight if you weren't at fault or agree to accept a small payment for your vehicle repairs without knowing that the amount will in fact cover the cost of all the repairs. If you've had a bicycle accident in the St. Louis Metro Area, St. Charles, St. Peters, Jefferson County, Franklin County, Wasington County, Lincoln County, we have the knowledge and resources to be your St. Louis Motorcycle Accident Lawyer and your St. Louis Bicycle Accident Attorney. Be sure to hire a St. Louis law firm with auto, motorcycle, truck, bicycle, pedestrian, car, bus, train, boat and airplane accident experience, wrongful death experience and insurance law expertise who can ensure you are properly represented and get the compensation you deserve.